In this tutorial we will examine what happens when you use DNS to lookup or resolve a domain name to an IP address. We look at how DNS lookups work, and the exact process involved when looking up a domain name. We follow the client DNS query as it is processed by the various DNS servers in the response chain. Before we start it might be useful to compare DNS name resolution with a standard question and answer that takes place in everyday life. Let’s assume you want to know what country Casablanca is in. Well the first thing you would probably do is ask one of your friends. This continues until you get an answer. On the other hand you could also just ask bob, and tell him to get back to you when he’s found the answer. In this case Bob does all the chasing for you. These exact processes are used when doing a domain name to IP address Lookup using DNS. 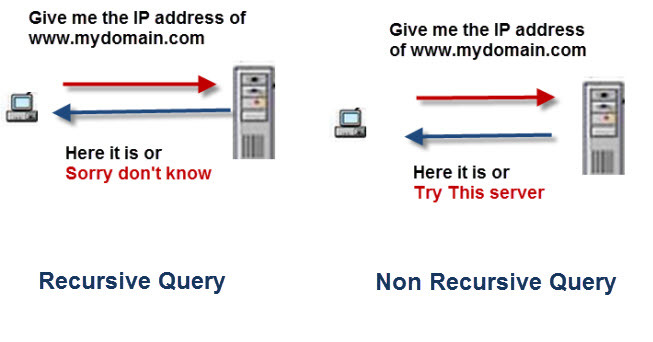 When a client or DNS server requests a DNS server to resolve a domain name it can use a recursive or non recursive query. Recursive queries are generally used by clients i.e. PCs and they tell DNS server to respond only with an answer and not a referral. A referral is essentially a response that says I don’t know the answer, but try this server it may know the answer. Non recursive or Iterative queries are used by DNS servers and essentially instruct the other DNS server to return an answer or return the address of another DNS server that may know the answer. 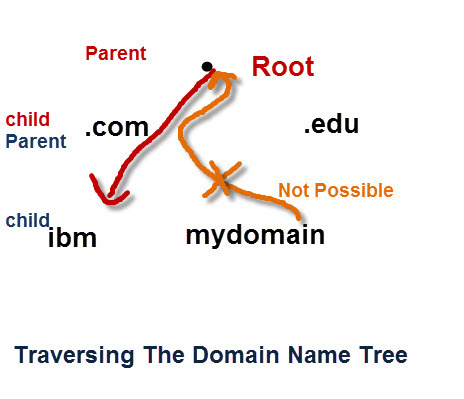 The Domain name structure is an inverted tree like structure starting at the root. You can consider it a parent child type relationship with the root being the parent. The way in which it is constructed is that parents know about their children, but children don’t necessary know about their parents. Therefore you can only traverse down the tree from the root and not up the tree. So if you contact a root server looking to resolve the name www.mydomain.com it might not know the IP address itself, but it would know the IP address of a server that knows about the .com domain name. Because almost all domain name queries need to use the root server there are many of them and they are busy. DNS clients and DNS server both use caching to speed up the domain name lookup process and to ease traffic on the root servers. If another client needs to resolve the same domain name using server A then server A can respond using the cached result. The schematic below shows two DNS lookups. In the first Lookup the local DNS server performs an interactive query and is directed down the domain tree to resolve the name. In the second query the Local server knows the answer and so returns the result from cache. After about 1 minute Client 1 makes another request for www.mydomain.com . The first request would need to go to the root and work down the tree. The second request goes direct to the server responsible for the mydomain domain as the local server already knows who it is. If the client2 uses Windows then it uses it’s local DNS cache. If client2 is Linux machine then it will need to go the local DNS server, which will return it from it’s cache. Understanding Host name resolution methods. Hi Steve, this is very educative thank you. you mentioned we can check the client side DNS cache by ipconfig /displaydns, but how about the server side DNS cache. Is it possible to that if you are not the network administrator? I have a question: suppose that I ask for IP of http://www.example.com, the Local Name Server will start from the beginning of the tree asking the Root NS that referrals to TLD .com NS and so on. But what happens if I ask a second query for another .com domain like http://www.test.com? Does the Local Name Server ask again to the root NS or it goes directly to the TLD NS responsible for .com? It uses the name server it already knows about until the cache times out. If it is cached then it will be non authorative. Clear explanation. Good. Thank You. I have doubt. I understand there are currently 13 root servers. So the local DNS server can query any of the 13 root servers first time. Right ? Likewise I assume there are many 2nd lever servers. Let’s say there are n no of DNS servers in the world keeping track of all the .COM domains. Again I assume each of them need to keep track of all the .com domains registered currently. So when someone creates a new website let’s say http://www.abcdefg.com. So does he have to add the ip mapping details in all n .COM servers ? It is added to the .com domain hosted by the company that he purchased it from e.g. godaddy. A process called zone transfer then transfers this entry to the other servers that have a copy of the .com domain name space. This is why it can take 15-30 mins for it to complete. I have been struggling to understand the inner workings of DNS and you have cleared that up for me. Thank you. I’d recommend this site to anyone that is needing help understanding DNS.